A thinner, lighter cable jacket and a compact connector—we know these are key design elements for today's custom integrator. 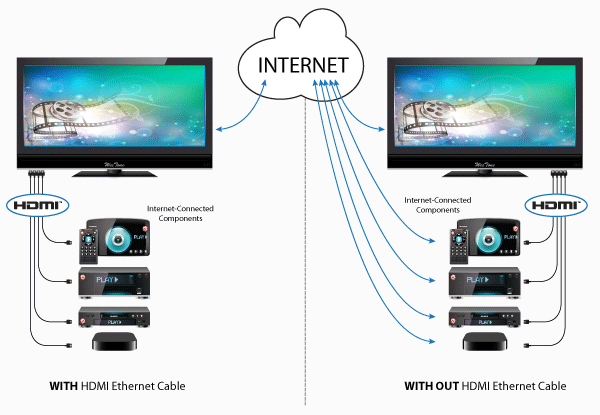 That's why we engineered our Element-Hz™ HDMI cables to make tight, low-profile installs effortless. Our cable's ultra-flexible jacket allows for easy 90° turns and the compact connector head makes it a breeze to install into any piece of equipment, no matter how small the space. And, rest assured that our HDMI cables deliver all of today's advanced video formats, even 4K! Element-Hz™ HDMI cables meet and exceed today's most advanced video formats—1080p, 4K, 3D, Deep Color, Dolby TrueHD, DTS HD-Master and Ethernet—all while performing better and costing less than any other cable on the market. The cable's round PVC jacket is extremely flexible and offers strong strain relief for those sharp 90° turns. Its lighter, thinner design allows for an easy fit behind your equipment. The modern display is thin – and they're only getting thinner. When they're up against a wall, a hulking HDMI cable won't get the job done. Fortunately, Element-Hz™ cables feature a connector head that's one of the smallest on the market. Now you'll be able to connect any wall mounted display without having to move it away from the wall. It's our job to make the installer's job as easy as possible. So, we developed a system of color coded connector heads that indicate each cable's length. Distinguishing between different cable lengths while staying organized has never been easier! What's more, our HDMI cables are finished with a vibrant, metallic finish that really pops! Easily share your network data stream over one HDMI cable. From your BluRay Player to the kids' gaming console, Element-Hz™ cables simplify your local network all while allowing a high speed data stream. All Element-Hz™ HDMI cables are UL Listed and CL3 Rated for in-wall installation. In addition, our cables meet ROHS Compliance standards. Ever been on the job and underestimate the length of the HDMI cable needed? Most HDMI cables are packed in standard poly bags, which can no longer be sold as new. That’s why all of our Element-Hz™ HDMI, VGA, & VGA with Audio come packaged in resealable bags. This simple package alteration keeps you organized while also allowing you to maximize your profits. Simply coil the cable back up and bag it for new! All Element-Hz™ cables feature gold-plated connectors for corrosion resistance and maximum signal strength. We know you wouldn't expect anything less.